None of these folks are Luddites, opponents of technology. Gates is the co-founder of Microsoft; Stephen Hawking is a world-famous theoretical physicist; Elon Musk is co-founder of PayPal, the founder of Tesla Motors and SpaceX; Sir Clive Sinclair is founder of Sinclair Research Ltd and Sinclair Vehicles Ltd. While these lovers and promoters of technology and science raise alarm, others argue that the inevitability of super intelligent machines raises questions beyond the danger that they may pose to humans and to each other. Writing in the prominent science journal Nature, Hutan Ashrafian argues for “machine rights” similar to those delineated in the Universal Declaration of Human Rights. Humankind is arriving at the horizon of the birth of a new intelligent race. Whether or not this intelligence is ‘artificial’ does not detract from the issue that the new digital populace will deserve moral dignity and rights, and a new law to protect them. Ashrafian is not the only one to argue that new intelligent and sentient machines will need protections from each other and from humans. The prominent ethicist and philosopher Peter Singer and his colleague Agata Sagan make the same case in “When robots have feelings,” an article published in The Guardian. Will the super-intelligent computers be friendly? Is it time to start thinking about what steps to take to prevent our own creations from becoming hostile to us? For the moment, a more realistic concern is not that robots will harm us, but that we will harm them. At present, robots are mere items of property. But what if they become sufficiently complex to have feelings? After all, isn’t the human brain just a very complex machine? If machines can and do become conscious, will we take their feelings into account? The history of our relations with the only nonhuman sentient beings we have encountered so far – animals – gives no ground for confidence that we would recognise sentient robots as beings with moral standing and interests that deserve consideration. The cognitive scientist Steve Torrance has pointed out that powerful new technologies, like cars, computers, and phones, tend to spread rapidly, in an uncontrolled way. The development of a conscious robot that (who?) was not widely perceived as a member of our moral community could therefore lead to mistreatment on a large scale. The hard question, of course, is how we could tell that a robot really was conscious, and not just designed to mimic consciousness. Understanding how the robot had been programmed would provide a clue – did the designers write the code to provide only the appearance of consciousness? If so, we would have no reason to believe that the robot was conscious. But if the robot was designed to have human-like capacities that might incidentally give rise to consciousness, we would have a good reason to think that it really was conscious. At that point, the movement for robot rights would begin. Right for robots is not the only “rights campaign” that engages the attention of Peter Singer. He is the author of Animal Liberation: A New Ethics for our Treatment of Animals (1975) which is frequently referred to as the bible of the animal rights movement. Singer and other advocates of animal rights speak from the platforms of prominent legal, academic and journalistic institutions. The Nonhuman Rights Project, which I lead, is a pioneer when it comes to pushing for animal rights. We are working with legal groups on three other continents to assist them in achieving legal personhood for “nonhuman animals.” We filed the first animal rights cases in the United States in 2013, in which we argued that four chimpanzees—Tommy, Kiko, Hercules, and Leo—were being held unlawfully by their alleged owners and were entitled to be released pursuant to a common-law writ of habeas corpus (one of the attractions of a common-law writ of habeas corpus is that it allows us to file suit on behalf of another who is being imprisoned). Our goal is to have these and other autonomous and self-determining animals declared to be legal persons, at least when it comes to unlawful detention. The roots of the animal rights movement do not lie in the anticruelty legislation of the nineteenth century; they reach deeper into the worldwide antislavery movements that began in the eighteenth century and flowered into the broad international human rights movement of the twentieth century. It may be no surprise to learn that Steven Wise was inspired to take up a career in animal rights by reading Peter Singer’s Animal Liberation. He currently teaches animal rights law at Harvard University and is the founder of the Nonhuman Rights Project. In the next post, “When animals and robots become people (2),” we will look at some of the theological and practical responses to robot and animal rights movements. Together, these two crusades highlight and focus the question of the 21st century: What does it mean to be human? 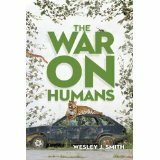 “The War on Humans” is available online—the video here and the book here. This provocative book and the companion video raise a host of issues that require further study. One of the best resources for this task is Brent Waters’ From Human to Posthuman: Christian Theology And Technology in a Postmodern World. While Waters doesn’t deal with animal rights, his arguments about the nature of the human person would apply.